Several weeks ago, I went to the Hayward Gallery at the Southbank Centre to visit the Human Factor exhibition. Spanning the past 25 years, The Human Factor focuses on artists who use the figure as a means for exploring far-ranging concerns. Compelling and thought-provoking, their work brings into play ideas about history, voyeurism, sexuality and violence, while reflecting on how we represent the ‘human’ today. At the same time, the artists in The Human Factor pointedly revisit and update classical traditions of sculpture, while drawing on representations of the human body in contemporary popular culture. Inventively remixing past and present, they transform that most familiar form – the human body – in ways that surprise, unsettle and engage us. I’ll be honest. I didn’t read any of the above or know anything about the exhibition. Instead, I saw the posters around of that oversized bear with his arm around a policeman and I thought that looked like an interesting childhood-themed sculpture . On closer inspection, though, ‘Bear and Policeman’ by Jeff Koons isn’t a cute, quirky sculpture but something far darker (which is clear if you actually take some time to note the bear’s creepy expression) with undertones of perverse sexual humiliation and dominance. That’ll teach me to judge a book by its cover. Or rather it doesn’t. It teaches me that if I am to judge a book by its cover, at least make sure I really spend time looking at the cover so I fully understand the cover before I judge it. The exhibition was generally full of dark surprises like this – a particular favourite of mine was by the witty Maurizio Cattelan, and involved walking in a room that was made to appear like a church towards a tiny, crouched figure at the front. At the back, the pious figure looks almost childlike and but as you move closer, you realise that this figure is actually Adolf Hitler. It shocks, surprises and encourages one to consider what he would be doing in a church – whether he seeks remorse or divine power to implement his regime of terror. 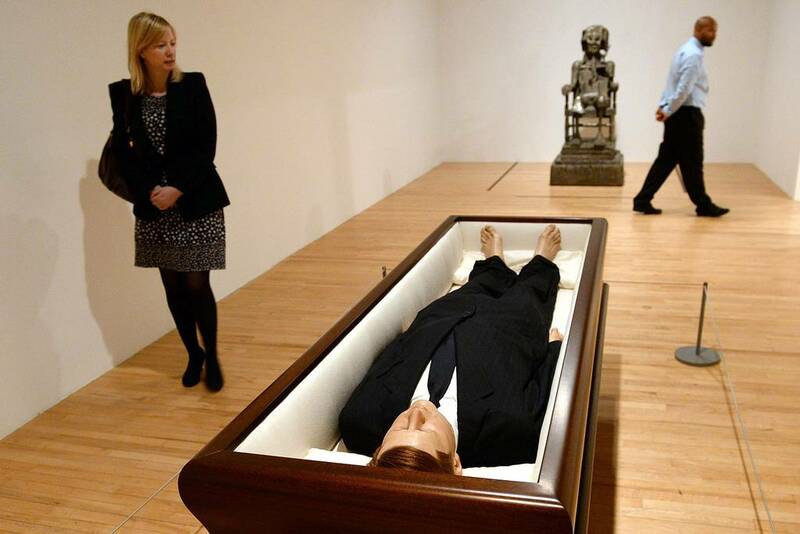 There was also an incredibly life-like sculpture of JF Kennedy’s corpse laid out in a coffin, in a sharp suit but with bare feet, evoking an air of odd familiarity towards this iconic American president, who almost appears to be sleeping peacefully. The overall ambience of the exhibition was unsettling – death, decay, despair, consumerism were but some of the themes explored, which is inevitable when grouping art under such an umbrella term as the ‘human factor.’ Perhaps it is me, though, and my weirdly high standards when it comes to art, but I felt some of the art works lacked soul and deeper meaning. They’d been created to shock and incite some emotion in the audience, but for me, while I understood the symbolism and the sculptor or artist’s intention behind the work, I didn’t feel anything. It was almost as though some of the works were too obvious: a sculpture of a modern-day Jesus to represent persecution still occurring today; a sculpture of a futuristic woman in the pose of a Greek god – the oxymoronic nature of the future with the past, modernity with tradition; crude sculptures of women with their buttocks, breasts and lips exaggerated to emphasise the objectivity of females… the list goes on. An interesting exhibition with a few witty and thought-provoking gems scattered amongst a sea of obvious, disappointing and unoriginal works.